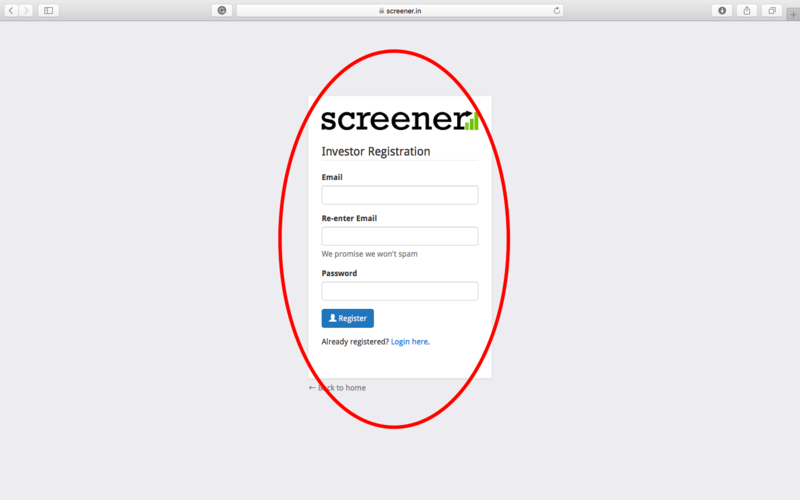 How to use SCREENER.IN like an Expert. 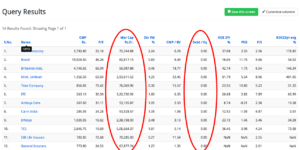 The screener is an amazing website to do the fundamental analysis of a company. 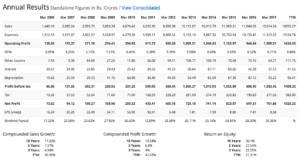 There are a number of Indian investors who use the Screener to read the financials of the company. As a matter of fact, the customized financial reports presented by the screener website is quite friendly and easy to use. 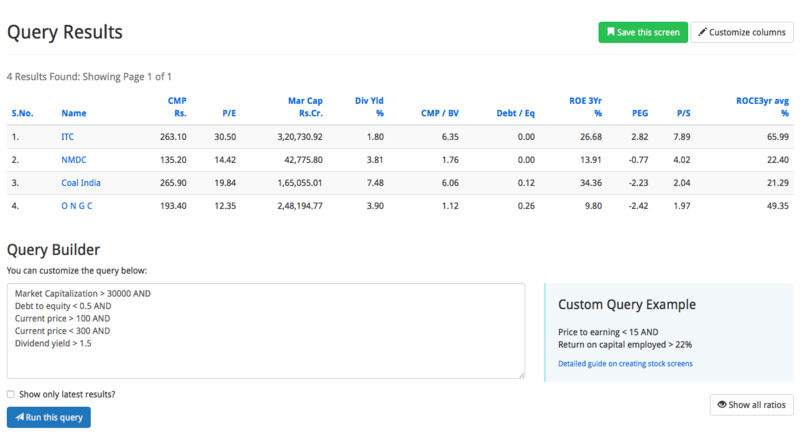 If you search any stock on the stock screener, you will get a number of important information about the company like an overview, chart, analysis, peers, quarters, profit & loss, balance sheet, cash flow, and reports. The best part is that you can read all the financial statements of the company for the last 10 years, all in one place (without scrolling down or changing the tabs). Here is an example of the pieces of information that you can get about ‘TITAN COMPANY’ on Screener. 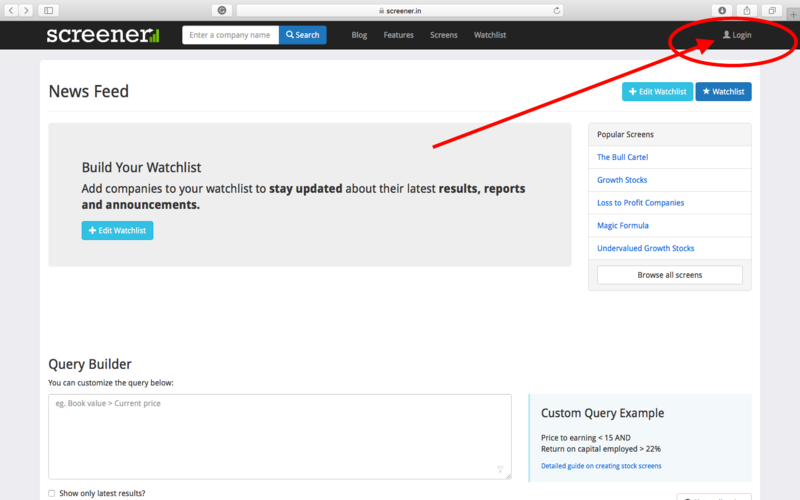 However, there’s one more powerful tool that many of the people are not using on the Screener website. Most people know how to use screener.in to read financials but do not know how to write a query in the query builder. What is a query? A query is a request for data or information from a database table or combination of tables. For example, if you want a specific type of stocks from a table of all the stocks listed, you can write a query to request that information. Query builder can be used in a number of ways. 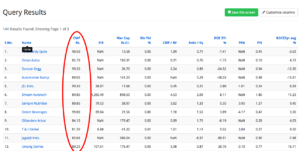 You can use it for the stock screener or find stocks with specific criteria. Personally, I use it quite often to screen the stocks. 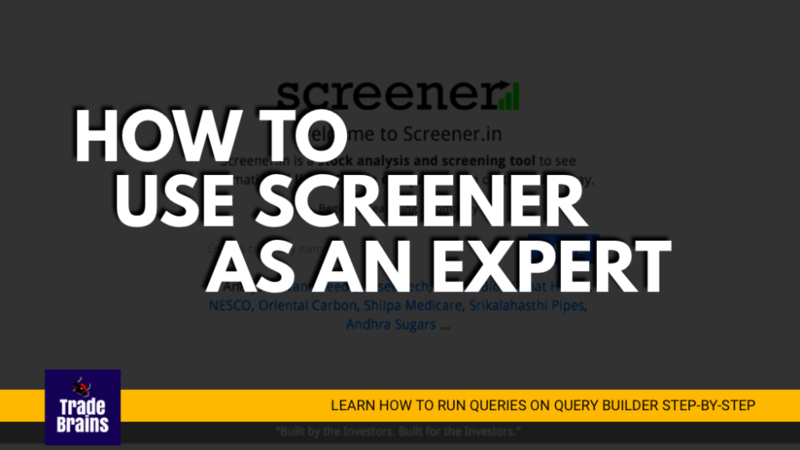 In this post, we are going to cover how to use screener.in website efficiently using query builder. Here, we will discuss the basics of the query builder. However, once you know how to use the query builder, you can write complex queries to the query builder. 1. How to find small-cap, mid-cap and large-cap companies? 2. 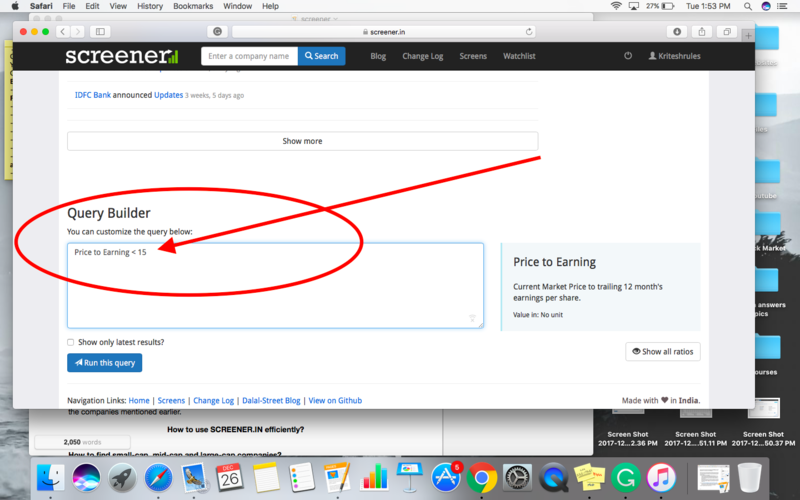 How to find penny stocks? 3. How to find debt free companies? 4. 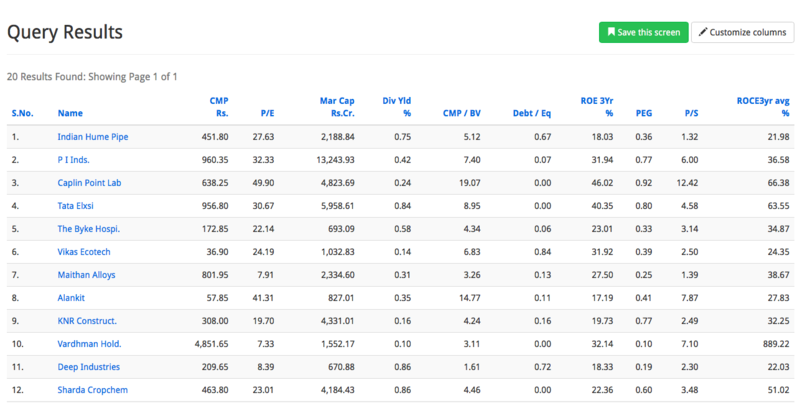 How to find debt-free large-cap companies? 5. 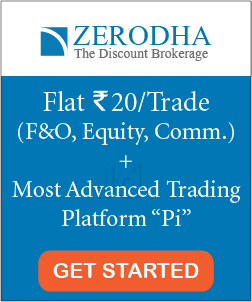 How to find low PE stocks? 6. How to find high dividend stocks? 8. How to run multiple queries on the query builder? 9. How to create your own screen? Now, before we cover all the topics mentioned above, you need to learn where and how to use query builder. You can find the query builder on the Screener website. Here are the steps to find the query builder. 2. Login using your username and password. If you do not have an account on the screener, make a new one using your email id. It hardly takes a minute. 3. 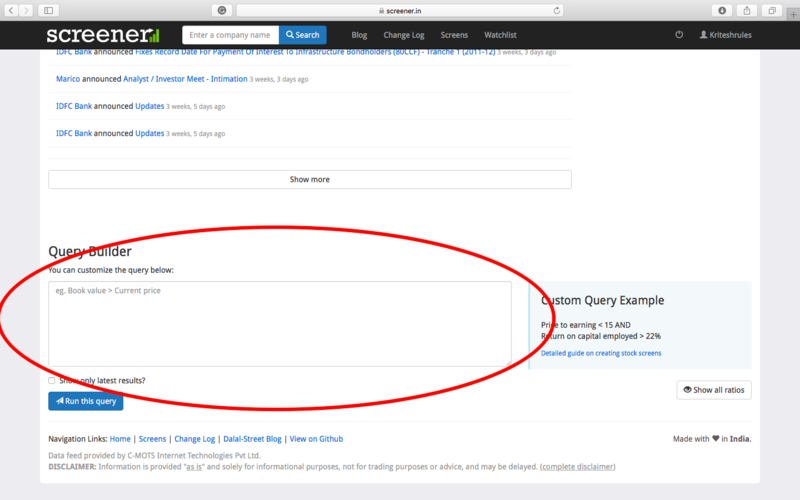 Once, you are registered/ logged in, scroll down to find the query builder. How to use query builder? In the query builder, you can write the queries to find the data/ information. The queries can either be of one line or multiple lines. 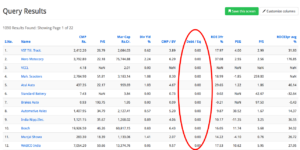 For example, if you want to find the companies with Price to earnings ratio less than 15, you can write the following query in the query builder. Here’s the result that you will get. This is the example of a one-line query. Note: This is an example of multiple line query as we are using two filters. Whenever you use a multiple line query, use an ‘AND’ after the end of every line. Further, you do not need to add ‘AND’ on the last line of query. Now that you have understood how to use query builder, let’s write few simple queries to shortlist the companies mentioned earlier. 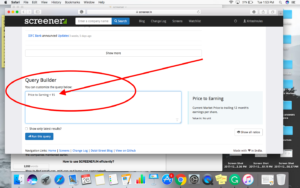 How to use SCREENER.IN like an Expert using Query Builder? 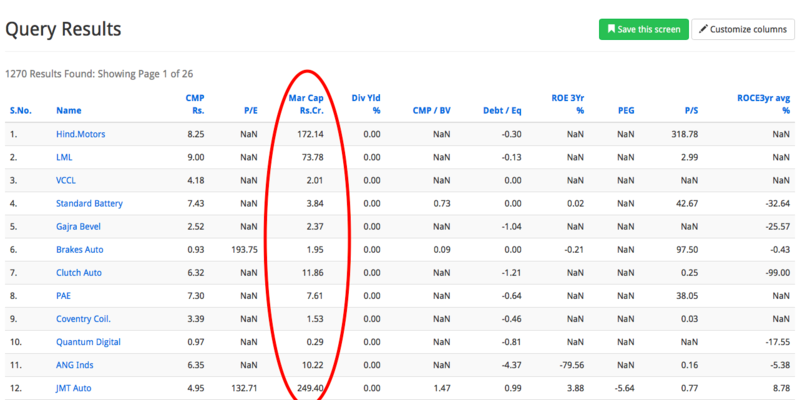 How to find small-cap, mid-cap, and large-cap companies? We are going to use market capitalization to find small-cap, mid-cap and large-cap companies here. Market capitalization: It refers the total market value of a company’s outstanding shares. It is calculated by multiplying a company’s outstanding shares with the current market price of one share. 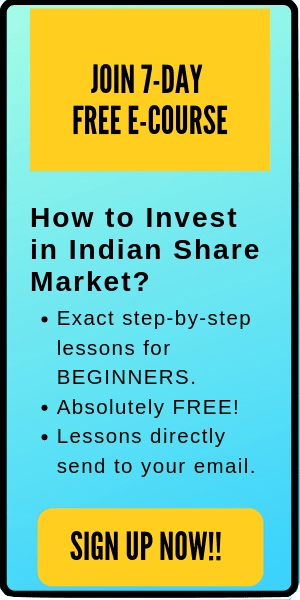 Read more here: Basics of Market Capitalization in Indian Stock Market. Now, how can you use the above information to find small-cap, mid-cap, and large-cap companies? You just have to write a query using market capitalization range to get the result. This query will limit the market capitalization between 500 to 10,000. Here is the result that you will get. 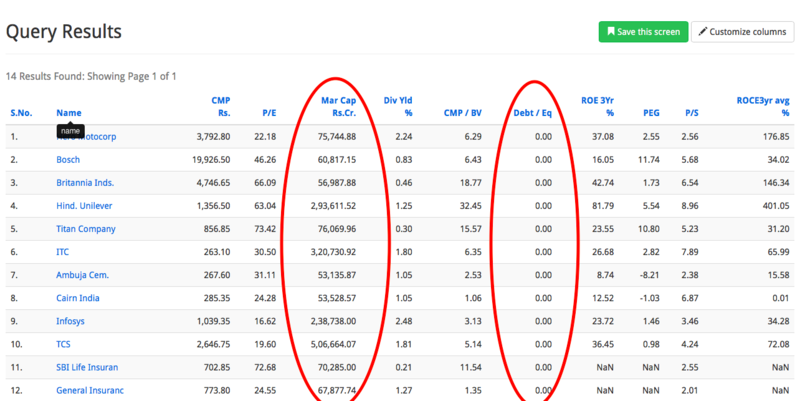 Now, can you guess the query to find the list of large-cap companies? You will get the following output for this query. As already mentioned above, the values of market capitalization taken here is not a hard and fast rule. You can write different queries depending on your criteria. 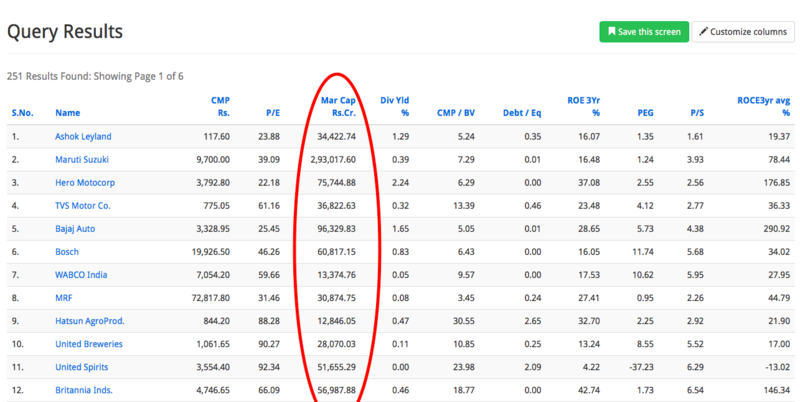 If you want the list of those companies whose market cap is large than 50,000 crores, you can write the following query. Similarly, you can write a number of queries depending on your requirements. Penny stocks are the companies with very small market share price. Typically, the share price of these companies is less than Rs 10. Further, they also have a small market capitalization (below 100 crores). 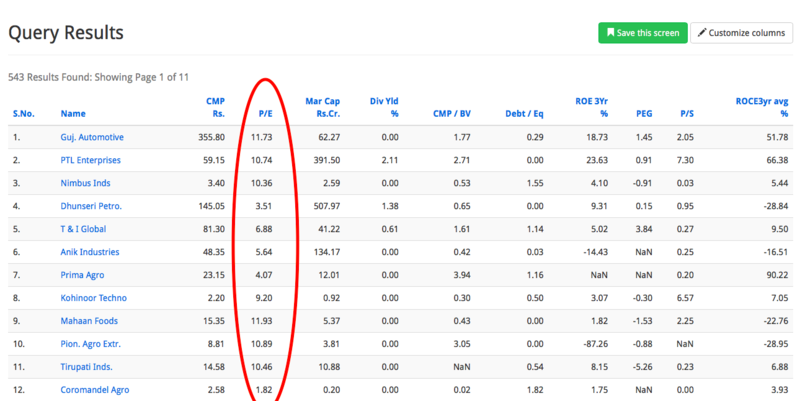 This query will give you the list of all the companies with current price of less than Rs 10 and market capitalization of less than Rs 100 Crores. How to find debt-free companies? If you are investing in a company for long-term, make sure that it’s debt free. Or at least that it doesn’t have more debts than its asset. The profitability and growth of a company are highly affected if it has a huge debt. To find the debt-free companies you can use the ‘debt to equity’ ratio. Debt to equity ratio: It measures the relationship between the amount of capital that has been borrowed (i.e. debt) and the amount of capital contributed by shareholders (i.e. equity). Read more here. If the debt to equity ratio is equal to zero, it means that the companies are debt free. If the debt to equity is equal to 1, it means that the debt is equal to equity. Now, most of the companies will have some debt as many a times the company require additional money to carry out different works like expansion, R&D etc. However, as long as the debt is less than equity, the company can be considered decent. 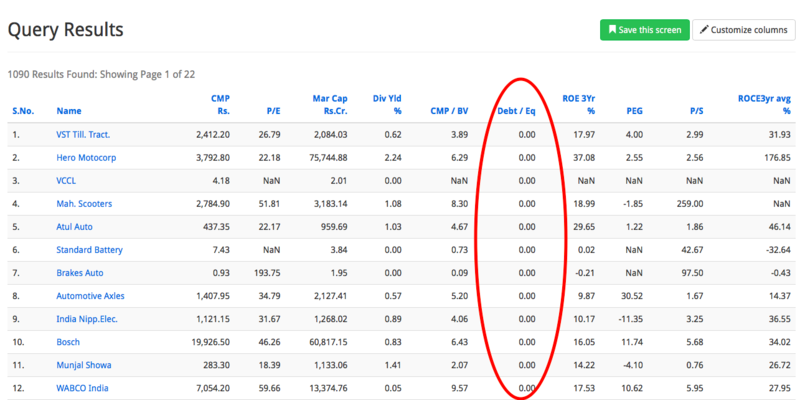 Note: You can also use ‘debt=0’ query to find debt-free companies in India. 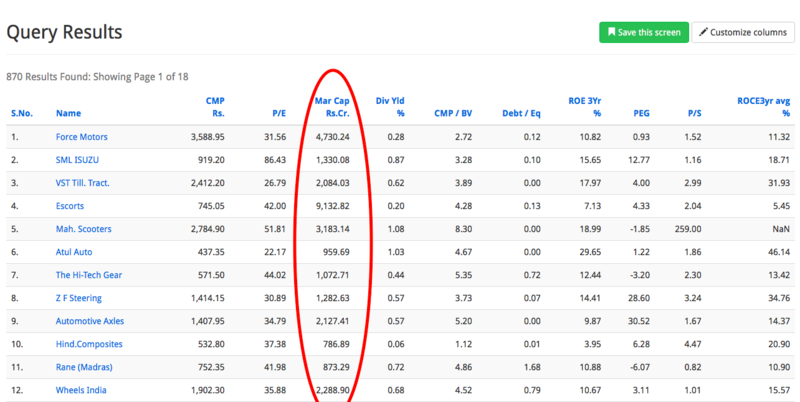 How to find debt-free large-cap companies? Note that you can take the market capitalization of the company accordingly. I took the company with the market cap greater than 50,000 Cr here. 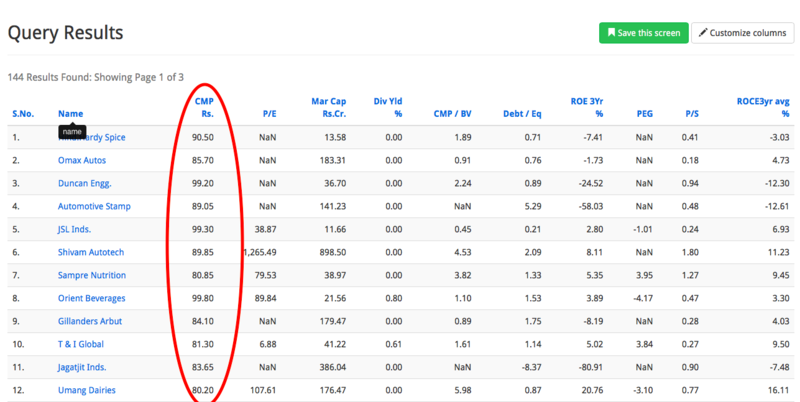 How to find low PE stocks? Please note that the list is a generic one and will give the name of the companies across all industries. How to find high dividend stocks? 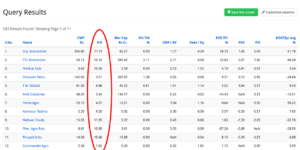 To find the list of high dividend stocks, you can use dividend yield in the query. 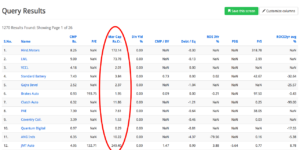 Dividend yield: A stock’s dividend yield is calculated as the company’s annual cash dividend per share divided by the current price of the stock and is expressed in annual percentage. Also read: Dividend stocks: Should you invest in it? How to find companies between a specific price range? You can use the Screener’s query builder to find the list of all the stocks within a specific price range. This will give you the following list of companies. 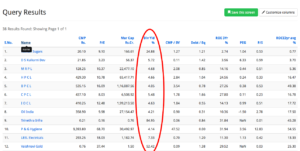 You can use this query to find the specific price range stocks accordingly. How to run multiple queries on the query builder? All the cases explained above are simple to find the specific type of stocks like debt free, penny stocks or high dividend stocks. Is that all? How to use SCREENER.IN query builder more efficiently? You can write multiple lines of queries on the query builder to filter companies with different criteria. This is the result that you will get for the above query. How to create your own screen? 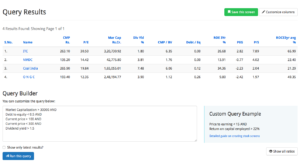 You can use different ratios to create your own stock screen. 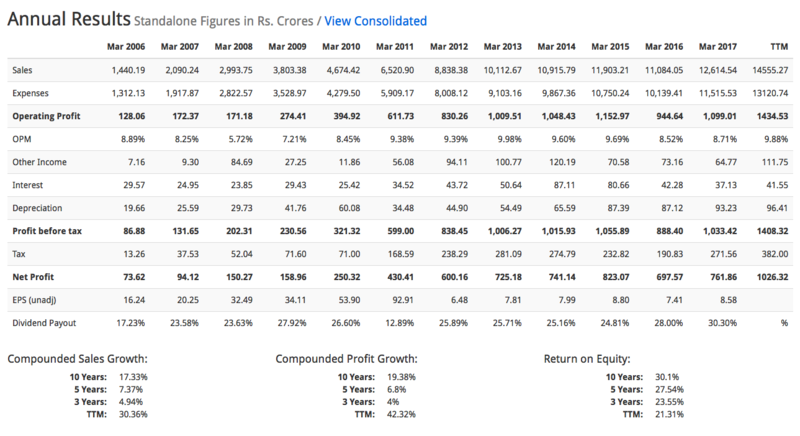 These different ratios can be ROE, ROCE, PEG, Sales growth, Profit growth, Current ratio, PE ratio, P/BV ratio etc. You can create your own screen using these different ratios to shortlist a few good companies. NOTE: THIS IS JUST AN EXAMPLE TO TEACH YOU THE BASICS, NOT A RECOMMENDED QUERY. Generally, I do not use a general query to filter the companies for the whole list, but use specific queries for specific industries. Different industries have different characteristic ratios. In a similar way, you can create your own screen with the help of different ratios. This can help you save a lot of time and energy. Query Builder is a simple yet powerful tool that can make your stock research 10 times simpler. 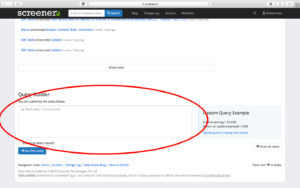 Writing queries in the query builder is easy as discussed above. Although there are lot many uses of Screener website, however, the most useful ones are covered in this post. Feel free to play around and create your own queries. If you want to learn more stock research tricks, feel free to check out my online course- HOW TO PICK WINNING STOCKS? The course is currently available at a discount. That’s all. 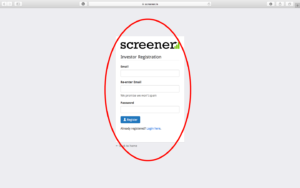 I hope this post ‘How to use SCREENER.IN efficiently?’ is useful to the readers. If you have any questions, please comment below.